TRAI's forwarded instructions to Bharat Sanchar Nigam Ltd (BSNL) in connection of with SMS packs offered to BSNL Customers with cheaper bsnltariff. 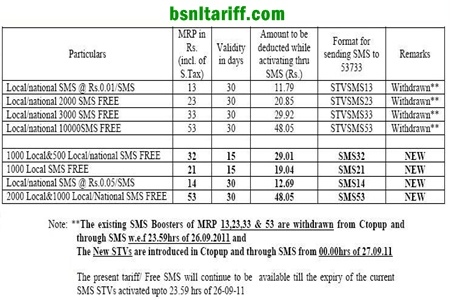 BSNL now announced its rationalized SMS Packs bsnltariff to limit of 100 SMSs per day per users. Earlier we know that BSNL withdrawn few STVs now its time for BSNL SMS packs of Rs. 13, Rs. 23 Rs. 33, Rs. 53 in replacement with NEW SMS packs at Rs. 32, Rs. 21 , Rs. 14 and Rs. 53 along with validity revision to the previous one. BSNL Customers can avail SMS Packs which are already recharged and enjoy the offerings at present bsnltariff/Free SMS till the expiry of the current SMS STVs packs activated upto 24.00 hrs of 26-09-11.